Last summer, I made a batch of these muffins for my friend. And it was all she could talk about since then. Every time she saw me, it was either "I'm dreaming about those muffins - they were so good!" or "Can you please make me some more of those muffins - they are so good!" or "My birthday is coming up, and all I want is your zucchini muffins! " Well, she celebrated her birthday last weekend (on beautiful Lake Minnetonka) and I did make her a batch. Needless to say, she was happy. Zucchini is slowly finding its way into the Minneapolis Farmers Market. Last Sunday, I saw them in about three stalls. But come July, they will be abundant. Also worth trying are hummus from Deana's Gourmet (the label on the container suggests using within seven days - it didn't make it past day two in my kitchen; that was that good), locally grown strawberries, and snap peas. 1. Set oven to 350 degrees F. Line muffin tray with cupcake liners. 2. Combine the first six ingredients, and set aside. 3. Whisk together sugar, oil, sour cream, eggs and vanilla. Add the dry ingredients to the wet ingredients, folding gently. Finally, fold in the zucchini and chocolate morsels, until fully incorporated. 3. Divide among cupcake liners and bake for 20 to 25 minutes until a toothpick inserted in the center comes out clean. Set muffin tray on cooling rack for five minutes then remove muffins from pans, and allow to cool completely. 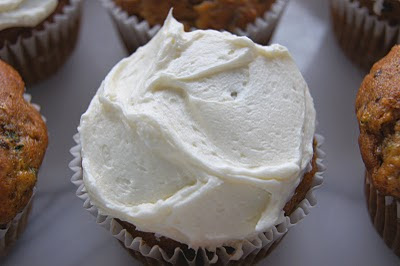 *Although it is unusual to frost muffins, birthdays require some sort of frosting, no? Here I used a basic butter frosting. Of course, this is optional. The muffins look awesome. Love the unique combination of ingredients. Great job. oh my, those muffins look amazing! The muffins look likez the real thing!! Very tasty & appetizing too! It looks great and yummy. Surprising zucchini works well in muffins and quick breads; makes them very moist. Hope you get to try this recipe. I appreciate you dropping by dears.